I have begun to despise Facebook. This incredible tool for connection seems more like a scroll of tragedies as of late.I recently awoke to the news that yet another youth, my friend Anas, from Aida Refugee Camp in Bethlehem was shot and taken into administrative detention. Unfortunately news like this is nothing new, but on this morning, the story hit close to home. When I lived and worked in Aida in the summer of 2015 I met Anas and, despite our language barrier, we managed to have many conversations. He loved humor and was always making others laugh. He was also one of the hardest working people I met, he was constantly helping others in the camp by working in the community center, building a communal play structure, or delivering food to other community members. Now the same platform that allows me to chat with friends in the West Bank and send congratulations for weddings, babies, and birthdays, also brings me updates about the ongoing human rights abuses perpetrated by Israeli forces. During my time in Aida camp, my elementary Arabic meant that I naturally became friends with children. I’d hold up objects asking them for the meaning in Arabic and they’d giggle replying with the name and asking me for the word in English. They taught me Dabke, traditional Palestinian dance, invited me to tea with their mothers, and discussed politics. The main project I worked on with the children of Aida camp was a mural. To begin, we sat down with a pencil and several sheets of paper and they sketched their ideas. 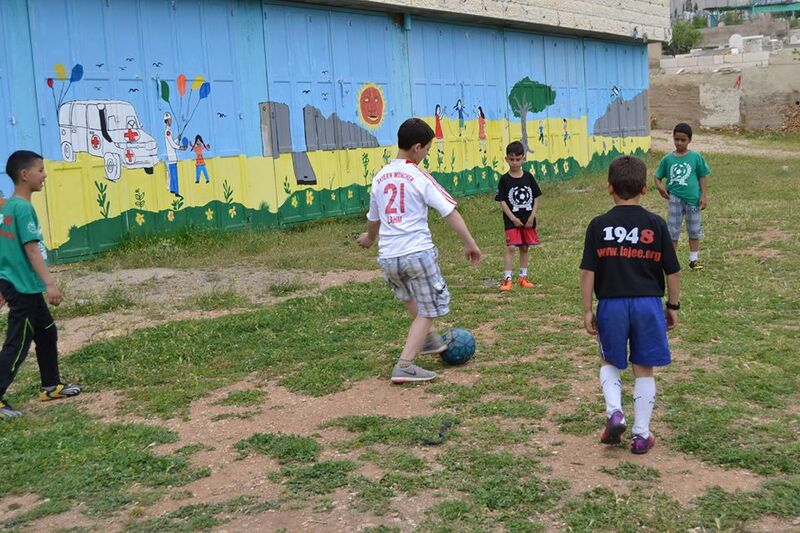 The final proposal depicted the kids of Aida playing next to a crumbling separation wall. While in Aida, I was constantly reminded of the realities of childhood in occupied Palestine. I would awake to news of another child being arrested in the night, an attempt from settlers to kidnap a young girl, or the horrific morning I woke up to the news that, Ali Saad Dawabsheh, an 18 month old, had been burned alive in a settler attack on his home in Nablus. Abdel was shot and killed by Israeli Forces in October 2015 outside of a UN building in Aida camp. He was on his way home from school. In Aida, military detention has become such a normalized aspect of life that if you ask someone whether they know anyone in jail they will respond with a hefty list of names. The children of Aida even created a play to teach other youth what to do when they are arrested by Israeli forces. The play aims to help keep children safe in the brutal world of military detention by teaching them how to survive while they are subjected to inhumane abuse. There is work for us to do to end this type of treatment and make the wall crumble like the children of Aida depicted in their mural. Let’s advocate and organize to live in a world that does not incarcerate youth and prioritize militaristic values over compassion. As U.S. citizens we should not sit in silence. We must build a movement that prioritizes human rights. Jewish Voice for Peace is a proud partner of the No Way to Treat a Child campaign lead by Defense for Children International-Palestine and the American Friends Service Committee to urge the U.S. government to appoint a Special Envoy that would be responsible for monitoring Palestinian youth’s experience and Israeli human rights violations. Last week Representative Betty McCollum lead 20 U.S. members of Congress in a letter urging President Obama to appoint a Special Envoy to protect the rights of Palestinian children. We are building grassroots power to change public opinion on this issue and we need more leadership like this among policymakers that prioritize human rights and compassion. By building on the grassroots work that is already taking place we can grow a stronger movement that shifts public opinion and moves our leaders to support something so obvious as defending the rights of children. Emma Tasini grew up in the Bay Area and is a rising junior at Pitzer College where she studies Middle Eastern & North African Studies. She is currently working as a JVP summer fellow.